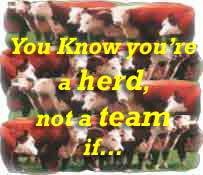 Turn your herd into a team! ...Your colleagues communicate with you primarily through email, memos or sticky notes. job is or who's really in charge. are working on the same projects! ...several people seem to be doing their own thing, but it just turns out to be different approaches to the same thing. ...candid, honest conversations about projects always happen before or after, but never during project meetings. transform your herd into a team!